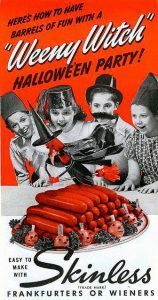 Cringe-worthy Halloween foods of the past, including mummified grapes, processed meats, and various pumpkin-themed dishes from the depths of Hell! 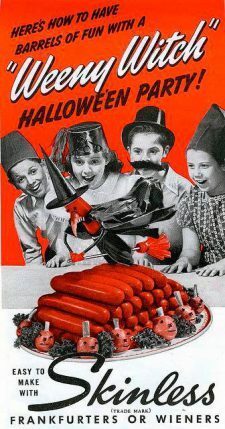 Forget about Thanksgiving and Christmas – the best holiday for gluttony has to be Halloween. And when it comes to eating on Halloween, for most of us, there’s really only one thing on our minds … CANDY. For kids, especially for those of us who grew up in less health-conscious times, Halloween was all about trick-or-treating to acquire massive amounts of chocolate and sugar, literally by the sackful. Unfortunately, once in a while, a well-meaning neighbor tried to give out healthy snacks, but we avoided those houses like the plague. As we crossed paths with fellow trick-or-treaters, we would even warn each other which houses were giving out apples or pears this year… or even worse, tiny boxes of Sun-Maid Raisins. No one really wants mummified grapes. Tricking innocent candy-driven children with dried fruit was bad enough, but back in the Golden Age of Processed Foods, manufacturers worked overtime dreaming up bizarre foodstuffs to take advantage of modern conveniences – whether powdered, gelatin-encased, dried, canned, or stuffed with preservatives. They were especially creative when it came to marketing for holidays, and Halloween was no exception! Read the entire article (and be grateful that times have changed!) at MeTV! That lumpy carrot-gelatin thing is to shudder, like plastic surgery gone bad. Luckily my mom was more traditional, a “Fanny Farmer” cook, who subjected us to nothing scarier than the occasional Velveeta or Tang. Growing up in the fifties and sixties, many were not so fortunate.